Banff National Park, Lake Louise, Lake Moraine, and Jasper National Park are premier travel destinations in the Canadian Rockies. From magical blue lakes to grizzly/black bear sightings from the comfort and safety of your car, there's something here for everyone who loves the great outdoors. Unfortunately, because of how popular these destinations are, hotels get booked out months in advance by large tour companies, and prices are ridiculously high during the popular summer months. Do you want to enjoy the beauty of Banff and Jasper without breaking the bank? In this post, I'm going to share all the frugal hacks we used to spend just $370 per person for a 6 day round-trip from San Francisco, CA. Considering that popular hotels in the area charge upwards of $250 per night during the peak months of July and August, how is this even possible? We flew from San Francisco to Calgary International Airport (YYC). We didn't pay any cash for this round-trip flight since we had plenty of credit card points from new sign-up bonuses. Our only out of pocket expenses here was $20 for a checked bag. Flights are often the biggest expense when it comes to travel. Even when you're redeeming points, you should try to optimize the flight cost to maximize the value of your credit card rewards. Check out Frugal Travel Series Part 3: Optimize Your Flights more tips on how to save on flights. At Calgary International Airport, we picked up our rental car. I racked up rewards and premier membership discounts from the time I used to rent cars regularly at a previous job (auditor life, y'all). I put these benefits to great use and rent cars from National's Emerald Executive Aisle every single time. Thanks to this discount, I get to pay for a full size car (roughly USD $30/day) and pick any car I like from National's airport parking lot aka "Executive Aisle." The total car rental for 6 days came to $184 USD including all taxes and fees. We got ourselves a sweet Nissan Pathfinder SUV for the week. Listen up, folks: this is where the big $$$ savings are. Ditch the search for hotels, motels, and Airbnbs. Canmore might be cheaper than staying inside Banff, but after long days of hiking, biking, canoeing and other sightseeing, you're going to thank yourself later for saying no to the long drive back and forth. Instead, pack a tent and book a campground. The campgrounds are extremely clean and well maintained, and most importantly, they are centrally located so you can avoid a whole bunch of back-and-forth driving. Parks Canada is the federal agency that manages all campgrounds in these national parks. Don't listen to third party travel agents who tell you that you need to go through them to get a campsite. You can book right on Parks Canada website! 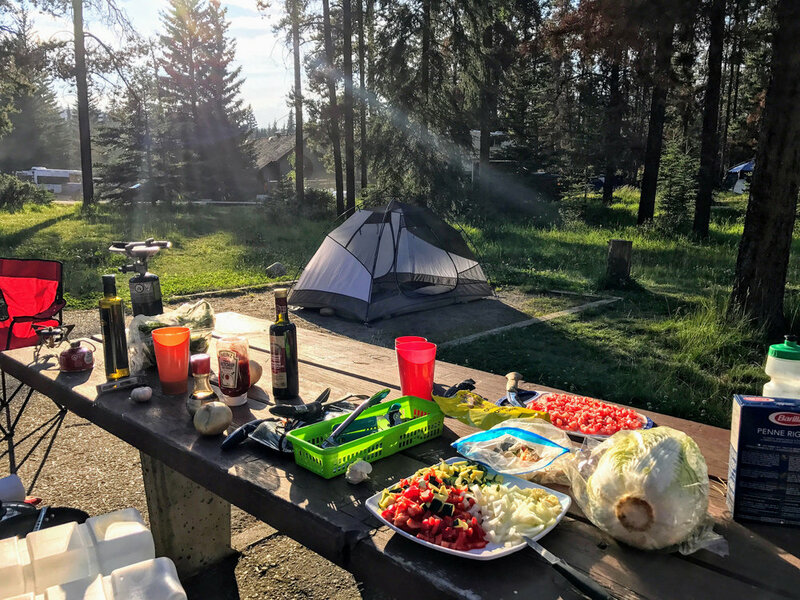 We stayed at the Johnston Canyon Campground in Banff and at the Whistler's Campground in Jasper. Both campsites were beautiful and spacious, came with HOT SHOWERS, clean flushing toilets, and drinking water on a tap. Each campsite can accommodate up to 6 people, and the cost comes to roughly $26/night. Savings of $200+ each night — a no brainer. I have to add here that we are not seasoned campers. It's really quite easy for newbies to set up a tent. And there are rental shops in both Banff and Jasper if you don't own a tent. Since you'll have a car, you can choose to skip any cooking at the campsite in favor of driving into town to get all your meals. The amount of money you save not paying for a hotel more than covers the cost of your outside meals if you're a small group. Now that you've got the basics figured out, time for the fun stuff! In 2017, Canada celebrated its 150th birthday so all National Park entrance fees were waived. Even otherwise, the entrance fees are quite reasonable and once you're in, you get to enjoy the endless beauty of the Canadian Rockies for (mostly) free. We've visited Banff/Jasper twice so far, and in the following sections, I'll be sharing a round up of our favorite places to see and things to do in the area. If you're camping in Johnston Canyon Campground, this hike is a must. The hike to Johnston Canyon Upper Falls is only a 1.5 hour roundtrip. The trail gets very crowded during the day time, so it's a good idea to go early in the morning, or later in the evening. We went there around 7:30pm and the crowds were non-existent. There's a restaurant and a convenience store at the trailhead if you want to pick up some food or snacks after the hike. Black bear spotted munching on leaves near Johnston Canyon. Warning: do not get out of your car anywhere near a bear! If you're in the mood for a fairly strenuous but absolutely thrilling hike, the 14.3 km Cory Pass/Edith Pass Loop is perfect for you. Don't let the distance fool you, the climb up is quite steep and the downhill scramble through scree can be pretty challenging. This is also bear country, so be prepared with a whistle and a large-enough canister of bear spray at minimum. What do you do after a long, tiring hike? Soak it up in the hot springs, of course! The hot springs at Upper Banff are very reasonably priced - we spent only $13 USD in entrance fees for the two of us and it was totally worth it. Beavertails Pastry - a canadian must! Once you're done at the hot springs, you'll probably be starving. Downtown Banff has plenty of options for food, but save some room for dessert! Beavertails is a Canadian favorite and you have to try it at least once when you're here. There's one location on Banff Ave., the main artery street that runs through Downtown Banff. Another great way to enjoy Banff is to rent a bike and explore. We drove up to Canmore and rented a couple of road bikes from Trail Sports. There's a lovely trail from Canmore to Banff that's mostly flat, so it's doable for most fitness levels. We parked our bikes in Downtown Banff and walked around for a bit before riding back to Canmore. Carve out at least 5 - 6 hours for this adventure, since you'll want to go at a relaxed pace and stop often to take photos and enjoy the natural beauty around you. Lake Louise is probably on your bucket list, but it's also on everyone else's bucket list. That means it gets really crowded during peak season and the parking situation can be pretty tough. Ideally, you can hike up one of the surrounding mountains for stellar views without the crowds, but if you're looking for a flat walk without any altitude gain, the lakeshore trail is worth it. Take it nice and slow and enjoy the views of the lake. This is a 14.6 km loop hike that takes you from Lake Louise to Lake Agnes Teahouse to the Plain of Six Glaciers Teahouse. Just 10 minutes into the Lake Agnes trail, the big crowds at Lake Louise magically disappear. The hike to Lake Agnes is short (3.5km) and you are rewarded at the end with a beautiful lake and a cute teahouse. Take a quick break and then continue the hike along Highline Trail (5km). The Highline Trail is remarkably quiet and empty in comparison to the Lake Agnes trail. At the end of Highline Trail, merge with the Plain of Six Glaciers Trail (5.5km) and continue until you reach the teahouse at Plain of Six Glaciers. 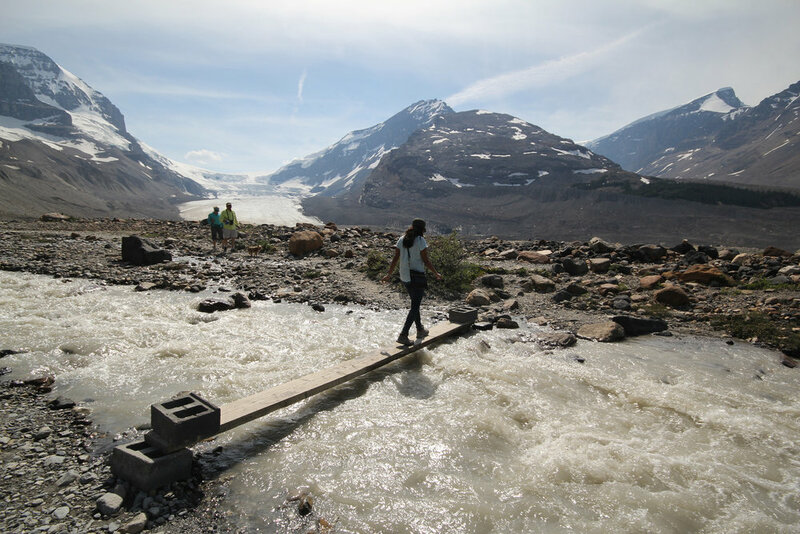 Plain of Six Glaciers gets you up to the glaciers that feed Lake Louise. If you want a bit more of a challenge, continue on the trail after the teahouse. The trail is not maintained after the teahouse and you will be walking on loose rock and mud. If you make it all the way to the top, you'll join a few other hikers enjoying the best view of the glacier. Head back to the teahouse to enjoy a well deserved hot cup of chai with some snacks and nibbles. Moraine lake is a short drive away from Lake Louise. At Moraine Lake, we hiked the Larch Valley/Valley of Ten Peaks trail to Sentinel Pass. This trail is 12km roundtrip with total elevation gain of 2400 feet. The first stretch of the hike is full of switchbacks and every now and then you get a glimpse of the sparkling Moraine Lake below. There is a flat stretch after the initial set of switchbacks as we reach the Valley of Ten Peaks. More switchbacks at the end of the Valley to the base of Sentinel Pass. The views from Sentinel Pass are pure gold and make every switchback worth it. Moraine Lake is far less crowded than Lake Louise and it's a joy to canoe around the peaceful lake. My first time canoeing was at Moraine Lake, and I have to say it was quite enjoyable. Bow Lake is literally by the side of the road. Start driving North on Icefields Parkway from Lake Louise and suddenly on your left, you'll catch a glimpse of this gorgeous picture-perfect blue lake. You have to stop for some photos! A little further along Icefields Parkway is my favorite spot on this planet - Peyto Lake viewpoint! There is a little trail that starts at the Peyto Lake viewpoint that is really deserted compared to how touristy the viewpoint is. Walk along this trail and you'll find a little clearing in the trees. When we went, there was not a single soul nearby and we had a stunning view of Peyto Lake all to ourselves. Nature’s best, pure and untouched. There's signage for Mistaya Canyon right on the Icefields Parkway and the canyon is just a short hike from the trailhead. The views are great and the short walk is a good stretch break to keep you energized for the road trip to Jasper. Further along the drive to Jasper, you'll reach Athabasca Glacier. We skipped the Snocoach rides (a bus that rides on top of the glacier for a closer view) and the skywalk and basically any other attraction that had a bunch of tourists flocking to it. Instead, we simply hiked to the toe of the glacier for free. The views are pretty great, and the markers showing the glacier recession over the years is pretty startling. Global warming is real, you guys. Athabasca Glacier is a huge visitor center so it's a good spot for a food/bathroom break along Icefields Parkway. We got to Athabasca Falls during Golden Hour and the sunset lighting made the whole place magical. The Falls have so much force that you get soaked from the mist, just standing around at some of the viewpoints. You can hike around the area for 30 minutes or so before heading back. This is definitely worth a pitstop! 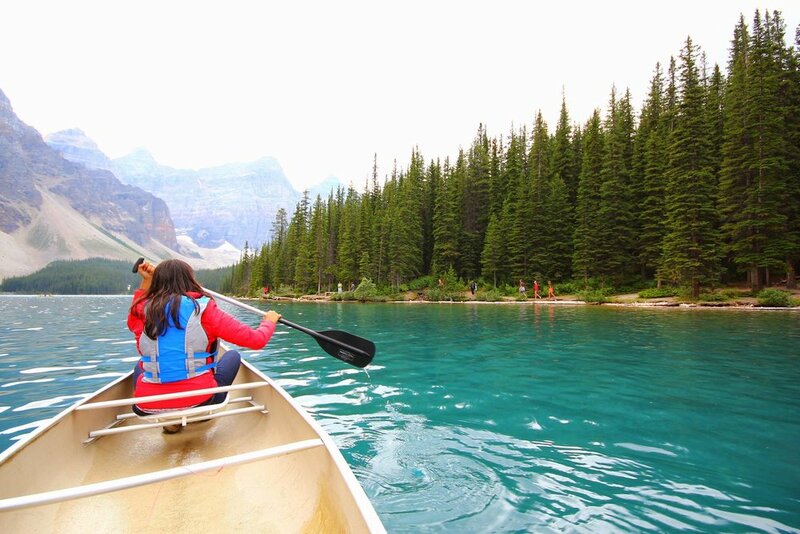 Maligne Lake is one of those famous Jasper attractions that makes it into every tour guide book. We decided to rent road bikes and cycle the 60-mile round trip from Jasper town. Vicious Cycles had great quality carbon frame bikes at reasonable rental prices. The ride to Maligne Lake is long and steep and therefore not advisable for beginners. However, the views along the ride are just fabulous, and the road is well paved all the way to Maligne Lake. It's also super easy to navigate this route since it's all one road for the most part — the Maligne Lake Road. These lakes are ~10 minutes away from Jasper by car. We made a quick stop here in the morning one of the days and got a great sighting of an elk up close. Mount Edith Cavell required permits in 2017 due to some road construction work. If you're planning to go here, be sure to check with the Jasper National Park Information Center if there are any permit requirements or other restrictions. The trail we planned to do at Edith Cavell, known as the Cavell Meadows Trail, was unfortunately closed that day due to the presence of an aggressive grizzly bear in the surrounding area. We didn't want a Revenant type situation, so we graciously backed off and stuck to the Path of the Glacier trail. This is a pretty short trail with nice views of the glacier and surrounding mountains. Sulphur Skyline trailhead is at Miette Hotsprings, so we mostly did this hike to make the hot springs soaking afterwards feel like it's more worth it. It's 8km round trip with ~2300 feet elevation gain. It's not a particularly difficult hike, but if you're already sore or not an experienced hiker, you'll definitely feel it on the climb. 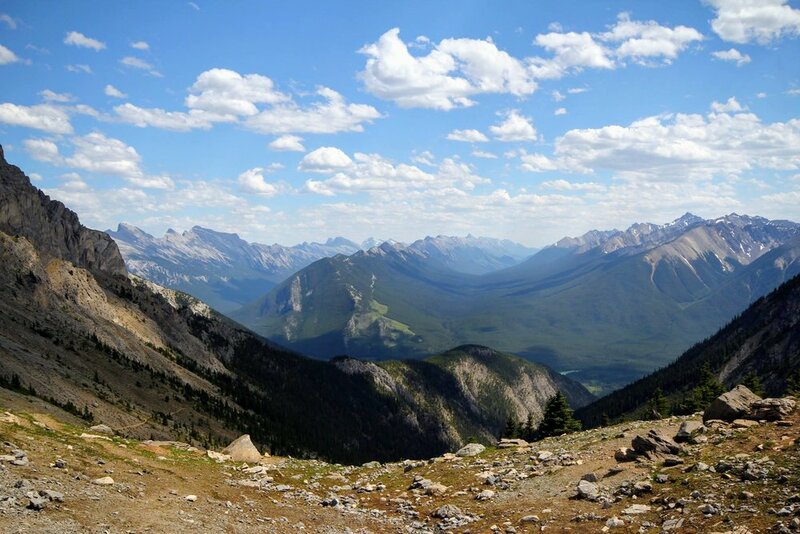 You can get 360 degree panorama views of Jasper National Park from this summit. Ice cream and hot tub after all the hiking and cycling? Yes, yes, yes! Similar to the Upper Banff Hot Springs, this is also run by the government and the hot springs entrance fee is very reasonable. We paid just $11 (CAD) for the two of us. The hot springs are situated in the middle of towering mountains and the scenery from the pools is pretty magical. The list here is only a small sample of beautiful places to experience in Banff and Jasper. I wanted to write this post to highlight to future travelers that, contrary to popular opinion, there are ways to completely avoid tourist traps when you're visiting an ultra-popular tourist destination like Banff, Lake Louise or Jasper. Canada is filled with endless natural beauty and Banff/Jasper is a perfect gateway to experience a small slice of the country's stunning landscapes and wildlife. Are you planning a trip to Banff, Jasper or other parts of the Canadian Rockies? Comment below if you have questions about logistics or trip planning and I will be happy to help! Want to save these tips to your Pinterest board? Pin the photo below! Finance vs. Frugality - What's the Difference?